"An expressive story about seasons, extremes, and waiting." - Kirkus ReviewsChildren play, birds call, and grownups go about their business during the hot days of summer in northern India. But in the bustle of street and marketplace, everyone is watching, waiting for those magical clouds to bring their gift of rain to the land. 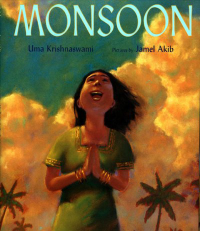 Through the observations of one young girl, the scents and sounds, the dazzling colors and the breathless anticipation of a parched cityscape are vividly evoked during the final days before the welcome arrival of the monsoon.